All I wanted to do was tell the stories, the best of the stories from my twenty years of work in the margins of our culture. So I wrote stories of the street people and the isolated people, the sick people and the dying ones, the creative people and the clever ones, the needy people and the generous ones, the “crazy” people and the demented people (two distinct afflictions). I wanted to tell the funny stories and the sad ones and the amazing ones, and let the readers draw their own conclusions as to which was which. I believed that readers could derive their own wisdom from a well-told tale. But the book-that-was-yet-to-be demanded more than a collection of vignettes. In its several iterations over the years, Meeting in the Margins has directed me with a variety of voices, not all of them welcome. Next was a friend who read some of the portraits and said they were “too hard.” He felt uncomfortable reading in such detail about being close to people who, our culture says, are supposed to remain invisible. And when I finally obeyed THAT voice, I was allowed to complete my manuscript. 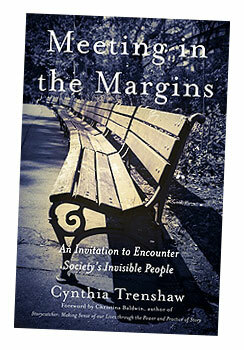 Meeting in the Margins will be published in October of 2015. Look for it at your favorite bookstore, or online, or here at this website.